Mimi Chao is an illustrator located in Downtown L.A.
Peruse Mimi Chao's illustrations and you will be struck with a longing for youth. The freelance illustrator's work invokes memories of childhood adventures, playful curiosity, and pure marvel. 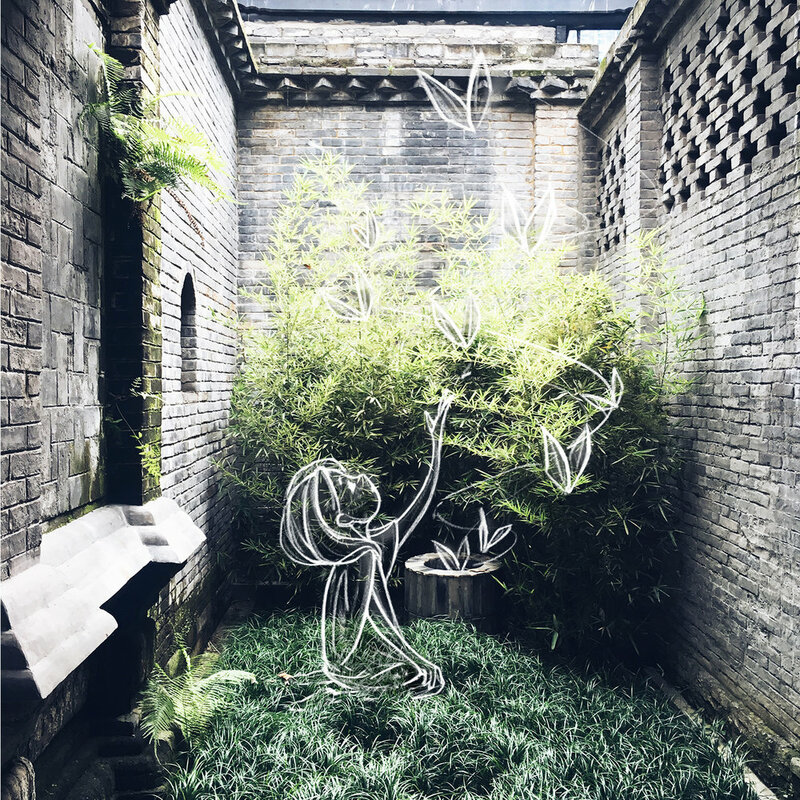 Whether it's wanderlust or wonderment, Mimi's illustrations pull at your heart strings. She's working hard on individual commissions, personal projects, and storybook illustrations. Although not formally trained in art, Mimi pursued her talents and encourages others to follow their dreams. Mimi illustrated the book In My World written by Jillian Ma. Courtesy of Mimi Chao. GR: When did you start making art? Mimi Chao: Growing up, I really liked drawing. But I’m a typical child of Asian immigrants. My parents said, "That's nice that you like drawing, but don't take it too seriously." So I went to UCSD for college because I didn't want to be that starving artist. I didn't know anybody who was in a creative field, and I thought I should do something more practical. I also saw all the amazing artists out there and thought, “I'm not at that level, so why should I try going for it?” I went straight from college to law school to working at a big law firm. In a sense, it was a success story, the American Dream. I grew up in a single parent household and we were relatively poor, so when I got the job I felt like I had made it. But on the inside I was miserable, and I started to draw again. It was more of an outlet to get back in touch with my creative side. At the same time, I also met friends who were pursuing their own creative dreams in L.A. Just seeing one example of a peer, or someone who looks like you, makes such a huge difference. I thought, “Maybe this is possible.” But I definitely didn't think of drawing right away. I'm super risk-averse, and yet I can't stand being unfulfilled and not feeling driven by what I’m doing. GR: How did you start illustrating professionally? Throughout that time people unexpectedly asked me to draw things for them. I was working at a graphic design agency, which is long hours, then going home and drawing at night. Finally I felt I needed to really focus on one thing, because there was no way I was going to get good at either if I did both at the same time. I freelanced full-time, but I only gave myself six months to make it. I had savings from when I was working at the firm. But I distinctly remember always thinking, “These are my rainy day savings.” My friend said, “Well, maybe this is your rainy day.” I had never thought of it that way. But the six months went by, and then a year, and now it's been two years. I've never been ready to say, “I'm done, I've made it,” but I've somehow found my way. I’m back to my childhood dream. When I started, it was a lot more client work. Right now, I'm trying to focus more on personal projects. It's a good mix of commissions and things I want to do. I've been grateful, but it's also been a long and twisting road. Let's Go Explore, "A Walk Through Mist." Courtesy of Mimi Chao. GR: What inspired you to start drawing as a kid? MC: When you're a kid you do what comes naturally to you, what feels right. I was really into anime and my brother played a lot of video games. He played Final Fantasy, Legend of Zelda, and Mario. I watched a lot of Miyazaki and Disney movies. In retrospect, as a kid, I was good at drawing expressions. My parents are divorced so I would see my dad on the weekends. We’d get lunch and he’d tell me to draw different things. I recently went home because my mom was cleaning out the house, and she wanted me to throw stuff away. Looking through my old work, I saw that my drawings were trying to express something. It's interesting that you can look back on what you were doing as a kid and see how it ties into what you're doing now. GR: What's one of the coolest things you've seen a fan say about you on social media? But I think all creators go through periods of, “What am I doing? Why am I doing this?” Or, “Am I good enough? Am I getting to where I want to be fast enough?” It's a good reminder that there are people who aren't examining your detailing. They just think my art helps them feel better. That's ultimately what I focus on and what drives me. There are times when my art is given as a gift and people cry because it means so much to them, more than any material thing. I think a lot about materialism and consumerism and what exactly it does for us, compared to relationships. I feel relationships have been devalued because people don't want to be too emotional. But they're the most important part of our lives. It’s why I value Miyazaki’s work, and the way he makes people think a second time about something they've taken for granted. I'm also driven by messages from people who feel more emboldened to make a change in their own life in part because they see a representation of themselves in me. When it comes to sharing my story, sometimes I wonder, “Is it premature? Is it really worth talking about right now?” But receiving these messages reminds me that being able to share my experience as Asian-American and female is so important right now. I do think representation in any community makes such a big difference. I know what it feels like to grow up not seeing that. Mimi also draws on photographs. This one is titled Generosity. Courtesy of Mimi Chao. GR: Is there a specific event in your life that has inspired you? MC: I wouldn't say there was one thing that directly led to a piece. Everything I do is drawn from something I've experienced in my life. You could look at a lot of what I've done and piece together what I was going through at that moment. The last year I was in law and transitioning my career, there were little things that happened to make me realize the job wasn't the right fit for me. At the same time, I also went through my first sad experience in a relationship. I've always been a very optimistic person, and drawing was a therapeutic exercise for me. Some people turn to music, or food, maybe drugs and alcohol. Art saved me. When I put my feelings on paper, it feels like a release, like it’s transferred out onto the piece of paper. Then, there’s the added benefit of sharing it and having people connect with it. GR: How do you define your style? Especially since you are not formally trained. MC: For a long time I felt like I didn't have a style. I never wanted to copy someone else because it was cool, or do what everyone else wanted me to.If I don't feel it in me, then I can't keep doing it. In terms of art, finding a style is a combination of who you are and what you like. I like Miyazaki, but I also like children's book illustrators that have a modern style. I like woodblock printing and old Chinese and Japanese calligraphy art. Somehow, when you absorb the things you like and focus on fine-tuning your skills, it really comes out. I can't explain it any other way. There's nothing intentional about what I draw. But all I want to do is get better at the craft. The style is just a reflection of who I am and what I'm interested in. I will never know for sure because I didn't go to a formal art school. I actually think it’s beneficial in terms of style because you aren't surrounded by your all-star classmates or teachers. I imagine there's a sense of competition that is hard when you're surrounded by people who are pursuing something similar. Of course, I could see people like James Jean love what they do, but it was always a matter of taking things at my own pace and reminding myself, “You can't compare your chapter one with someone else's chapter 25.” If you look at my stuff from even a year ago, it's changed a lot. But I think the essence is still the same, because the core of my personality is the same person. GR: What medium and methods do you use? MC: I think in pencil and paper, so it's easiest for me to sketch in a notebook. But almost everything I do now is digital. It's way easier to undo, it's environmentally friendly because you're not wasting a lot of paper and materials, and it’s in line with everything that's evolving digitally. You need the analog side to feel like it's tangible, but there are so many benefits of working digitally, especially with clients. If they said, “I wanted that hat to be red,” that's a lot of work to redo in a painting. Digital is so much easier, and clients know that and expect illustrators to make small changes fairly quickly. When I started taking illustration more seriously, I took a class on digital painting with an ArtCenter professor to help me transition from working with colored pencils, markers, and watercolor to a digital medium. I've never looked back. It just makes so much more sense. Mimi drawing with the iPad Pro and Pencil. GR: What device do you use? MC: I really like the iPad Pro and Pencil. If you are just getting started but taking it seriously, it's an amazing tool. It's still not as powerful as Photoshop and Wacom. I'm still fine-tuning the process. I’ll do some sort of sketch work and my weekly illustrations on the iPad. But when it's a full color painting, I'll do it on Photoshop because there are so many more useful controls. GR: What are your top five art apps? MC: I recommend trying to keep things as minimal or streamlined as possible. There is such a wealth of options these days, that it's best to just tailor your apps. One, obviously, is Photoshop. I use Photoshop most of the time. On the iPad, I think ProCreate is the best in terms of digital painting. Then there is this app called Concepts. It's geared a little more towards architectural or industrial design drawing, but when I'm storyboarding and moving things around I find it very convenient. Those are the three main drawing apps I use other than a pencil and paper. But a huge part of being a freelancer and being self-managed is organization. I think a lot of artists don't realize that. They think, “I can just draw all day and that's it.” But actually half of my time is coordinating with clients, or managing my projects or just doing admin work. I really like Evernote for keeping track of both my daily to-dos and ideas. Especially in anything creative, you need to write down your ideas right away or else you'll forget. Different people have different opinions about Trello, but I really like it for managing my custom work and my personal projects. Finding the one thing you really enjoy drawing with, and figuring out a good organizational system will make you so much more valuable to clients. GR: What would be your advice to somebody who is afraid to defy their parents’ expectations? MC: I hope my example shows it is possible. I don't think I'm an especially lucky or brave person; a lot of it is fear. There seems like such a huge wall, but once you say you’re going to do it, the fear is behind you. Then you think, “Oh, that wasn't so bad.” The caveat is you should plan. It doesn't always work out, so it's good to think through your process. And you have to know yourself in order to find the right fit for you. Why do you want to do art? Is it because you think it's easy or cool or because you really have a passion for it? If you have the passion, I really think you should do it. Whether it's art or law or medicine, you should do what you care about. A lot of times, Asian Americans feel selfish pursuing what they want to do versus the responsible thing that will make their family proud. But at the end of the day, you can’t get exceptionally good at whatever you do, unless you really care about it and are willing to put in those extra hours. I've never been able to work hard at something I didn't care about; maybe that's a character flaw that turned out to be a guiding strength. My dad, a typical Asian parent, literally said, “I think you're lowering your value,” and “Why can't you just do this at night?” It sounds so hurtful and it is on an individual level. But so many Asian parents have said this to their kids. They come from a place of love and they mean well. They had their own experiences of struggle. But they also need to see that it's our fortune as their children to have the opportunity to chase something we want to do in America. In the end, the things preventing me were thoughts like, “I'm scared of what my dad will say,” and “I'm scared of what people might think if this doesn't work out.” But when you go for it and you work hard, things just happen. Things follow with you. Even though you might not be able to see how your destination ends, your path is literally building under you as you're walking. I don't think the fear should prevent you from doing anything. Mimi's weekly illustration from January 9th. Courtesy of Mimi Chao. You can see it isn't just in art. I love Chef's Table, and many of those stories are very similar. In this day and age with social media, you'll find a way forward if you're good at what you want to do. You can go to art school, but it's expensive. From what I can tell there's a potential for burnout. But at the same time, you're guided by incredible professionals. If you can't afford to go to art school, don't feel discouraged. There are so many ways to learn on your own now within illustration, design, photography, and even coding. You just need to have self-motivation and the drive to do it. GR: What’s next for you and your company Mimochai? MC: In the past few months I've been moving towards a more even balance between my freelance practice and building Mimochai. It's a challenge but it's also interesting to see them synergize; my most interesting freelance work now goes beyond illustration to also include creative direction with story development and character concepts. I really enjoy working at this big picture level. Similar with illustration, it happened organically where people saw that I was building story concepts for my personal projects and asked if I could help them do the same. It reaffirms my belief in doing your best work in what you love and putting it out there.